Stan Kroenke has moved a step closer to completing a full takeover of Arsenal after minority shareholder Alisher Usmanov accepted an offer worth in excess of £550million for his stake. American businessman Kroenke currently owns 67 per cent of the Gunners through his company Kroenke Sports and Entertainment and has offered to purchase the 30.04 per cent held by Usmanov’s Red and White Securities firm, valuing the Premier League club at £1.8billion. Usmanov confirmed in a statement released to Press Association Sport that he had accepted the offer for his shares but did not give a reason as to why he has now opted to cash in. The move has been met with widespread derision from Arsenal supporters, many questioning the timing of the offer – just three days before the start of the new Premier League season. “We appreciate Mr Usmanov’s dedication to the Arsenal Football Club and the storied ethos and history the club represents. “The successful implementation of the offer will result in the opening of a new chapter in the history of the club in bringing 100 per cent private ownership by KSE. Usmanov added his own brief words but did not clarify the reasons behind his decision. Meanwhile, the Arsenal Supporters’ Trust has voiced several concerns over the potential takeover in a strongly-worded statement of its own. Within two hours of the announcement the phrase ‘#KroenkeOut’ was trending on Twitter in the United Kingdom. In October last year KSE offered around £525million to buy the 18,695 shares held by Usmanov, the Russian businessman who himself attempted to buy-out Kroenke in May 2017. The Gunners last won the Premier League title in 2004 and last season finished sixth, 37 points behind champions Manchester City, who they face in their opening game of the season on Sunday. 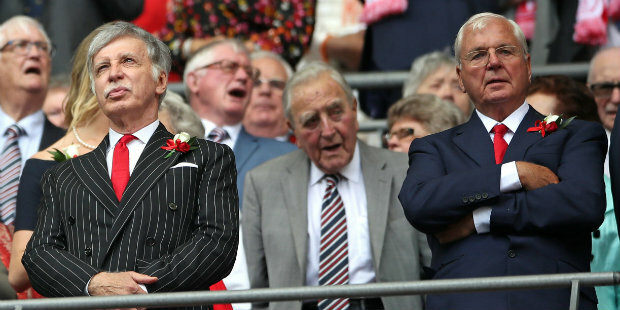 Be the first to comment on "Kroenke’s bid for control of Arsenal is accepted by Usmanov"